OBJECTIVE To assess the value of sequential lactate measurement in predicting postoperative mortality after surgery for complex congenital heart disease in children. SETTING Sixteen bedded paediatric intensive care unit (PICU). SUBJECTS Ninety nine children ( 90 survivors, nine non-survivors). MEASUREMENTS Serum lactate and base deficit were measured on admission and every six hours thereafter. Data were analysed by Mann-Whitney and Fisher’s exact tests. RESULTS There was considerable overlap in initial lactate values between the survivor and non-survivor groups. Initial lactate was significantly raised in non-survivors (median 8.7, range 1.9–17.6 mmol/l) compared with survivors (median 2.4, range 0.6–13.6 mmol/l) (p = 0.0002). Twenty one patients (21.1%) with initial lactate concentrations greater than 4.5 mmol/l survived to PICU discharge. Using receiver operating characteristic analysis an initial lactate of 6 mmol/l had the optimum predictive value for mortality. Initial postoperative serum lactate >6 mmol/l predicted mortality with sensitivity 78%, specificity 83%, and positive predictive value of only 32%. CONCLUSION Initial lactate concentrations have poor positive predictive value for mortality. 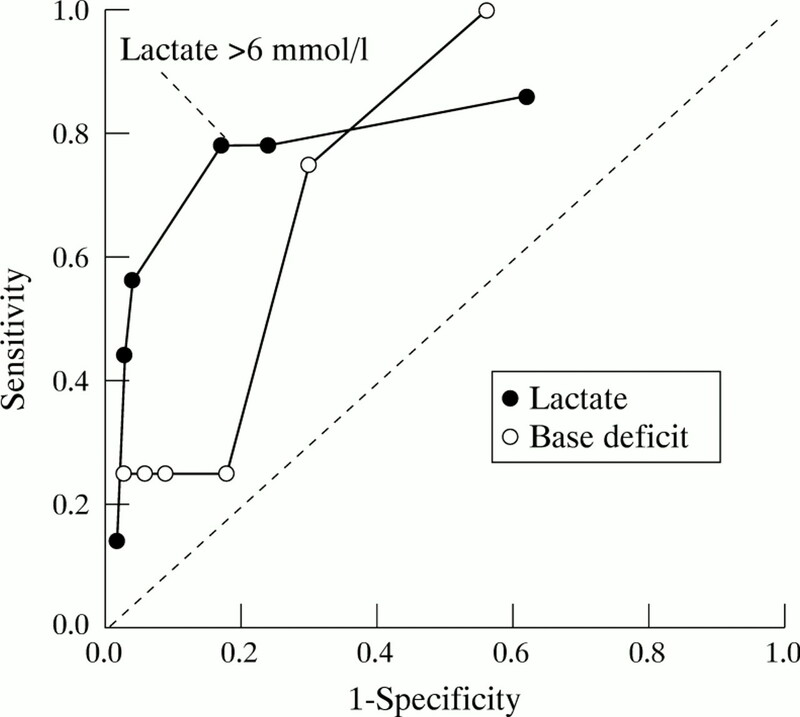 The routine measurement of lactate for this purpose cannot be justified in clinical practice. Prediction of outcome immediately after complex cardiac surgery is difficult, as both measurement of conventional haemodynamic parameters and risk scoring systems, for example the paediatric risk of mortality score (PRISM), have been shown to be inadequate for prognostic purposes.1 2 Consequently attention has focused on the use of biochemical parameters, notably serum lactate concentrations, which might reflect critical oxygen supply dependency. We report the findings of a prospective observational study of sequential serum lactate measurement after complex paediatric cardiac surgery. Ninety nine patients (90 survivors/nine non-survivors) admitted to the paediatric intensive care unit (PICU) at Guy’s Hospital after surgery for complex congenital heart disease,8 were enrolled into the study over the period December 1995 to July 1996 (see table 1). Patients falling into the lowest category of complexity, including those undergoing procedures such as atrial septal defect repair, patent ductus arteriosus ligation and Blalock-Taussig shunt, were not enrolled. At our institution the cardiopulmonary bypass pump prime comprised a mixture of blood and synthetic colloid. Not more than 25–100 ml of Hartmann’s solution was added, so that the pump prime itself was not a significant source of extraneous lactate. Full cardiopulmonary bypass flows were calculated at 1.6–2.4 l/min × body surface area. The total cardiopulmonary bypass time (minutes) was recorded for each patient. Anaesthetic technique varied according to the anaesthetist, but no routine adjunctive medication, such as β blockade, or ‘deep anaesthesia’ was used. Central venous lines, pacing wires, and peritoneal dialysis catheters were routinely placed at operation. All surgical procedures were performed by the same cardiac surgeon (DA) over the study period. Patients were transferred directly to the PICU immediately after surgery. After admission, the majority of patients were paralysed and sedated over the first 12 hours, using morphine 10–20 μg/kg/hour and vecuronium 80–120 μg/kg/min. Serum lactate (mmol/l), arterial pH, and base deficit (mmol/l) were measured immediately on admission to the PICU and at six, 12, 18, and 24 hours. Lactate was analysed using the Yellowstone Instruments YSI 2300 STAT plus analyser. Outcome measures were postoperative complications and survival to discharge from the PICU. Postoperative complications were categorised into two groups: group 1—those that might reflect end organ damage, including liver dysfunction, requirement for peritoneal or haemodialysis, and seizures and group 2—other cardiac or mechanical, including atrial or ventricular arrhythmias, reintubation in the PICU, and reopening/failure to close the chest. For the purposes of correlation with lactate, a ‘complicated postoperative course’ was defined as the presence of any complication in group 1. Routine serial measurement of lactate and acid-base parameters constituted standard practice in the PICU at that time, and therefore informed consent was not obtained. Each blood sample comprised 0.6 ml in total. Data were analysed on 99 children, median age 5 months (range 0.38–31 months). The distribution of complexity, mortality, and initial serum lactate is shown in table 1. Patients undergoing more complex surgery had significantly higher initial lactate concentrations (p = 0.0032). Median initial lactate was 2.4 mmol/l in the survivor group compared with 8.7 mmol/l in the non-survivor group (p = 0.0002) (see table 2). There was considerable overlap in lactate concentrations between the two groups. Initial lactate ranged from 0.6 –13.6 mmol/l in survivors and from 1.9–17.6 mmol/l in the non-survivors. Twenty one children (21.1%) with initial lactate greater than 4.5 mmol/l survived to discharge from the PICU. The postoperative course was complicated by seizures (n = 6), liver dysfunction (n = 15), dialysis (n = 15), reintubation (n = 7), arrhythmias (n = 13), inability to close the sternum (n = 5), and reopening of the chest in nine patients. Median initial lactate was 6.1 mmol/l (range 0.8–17.6) in the complicated group compared with 2.2 mmol/l (range 0.6–13.0) in the uncomplicated group (p < 0.0001). ROC analysis was employed to determine the optimum cut off for prediction of mortality, and an initial lactate concentration of 6 mmol/l was found to be optimum, with a sensitivity of 78%, specificity of 83%, and positive predictive value of only 32%. An initial lactate level above 6 mmol/l predicted complications with a sensitivity of 50%, specificity of 90%, and positive predictive value of 68%. The median initial base deficit was −5.4 mmol/l (range −2.8 to −16.3) in non-survivors compared with −2.25 mmol/l (range −1.5 to −8.6) in survivors (p = 0.049). The presence of a metabolic acidosis, as reflected by a base deficit worse than −4 mmol/l, was not significantly associated with non-survival. Indeed, ROC analysis of severity of base deficit revealed no consistent optimum cut off value (see fig 1). The combination of metabolic acidosis with hyperlactataemia did not improve the predictive value for mortality—the presence of lactate greater than 6 mmol/l plus base deficit worse than 4 mmol/l had a sensitivity of 75%, specificity of 92%, and positive predictive value of only 38%. ROC curve showing sensitivity and (1− specificity) of initial serum lactate and base deficit for mortality. The median total cardiopulmonary bypass time was significantly longer in non-survivors (101 min) than survivors (73 min) (p = 0.0125). Although total cardiopulmonary bypass time correlated with the serum lactate concentration with statistical significance, the rvalue was low (r = 0.23, Spearman’s rank correlation) and this was not thought to have clinical significance. Similarly, patients with an initial lactate greater than 6 mmol/l had a median total cardiopulmonary bypass time of 86 min, which was not significantly longer than those with lower lactate concentrations (73.5 min). Initial postoperative serum lactate concentrations have been used to predict outcome in paediatric practice. Siegel et al reported a series of 41 children who underwent open cardiac surgery with cardiopulmonary bypass.5 Mean lactate concentrations in survivors were 2.4 mmol/l (range 1.1–4.2) compared with 6.9 mmol/l (range 3.9–10.2) in non-survivors. Subsequently, Shemie reported the relationship between serum lactate and complicated outcome in 109 children after cardiopulmonary bypass.6Mean (SD) admission lactate in non-survivors was 13.7 (8.9) mmol/l compared with 6.8 (3.7) mmol/l in survivors. Lactate concentrations greater than 5 mmol/l were associated with 75% sensitivity and 84% specificity for complications. We are unable to explain the improved survival in our group of patients with raised lactate, but it suggests that postoperative hyperlactataemia not only reflects intraoperative tissue oxygen debt and hepatic clearance, but also variations in practice between cardiac surgeons, anaesthetists, perfusionists, and paediatric intensivists. The findings of previous groups suggest that lactate concentrations could be used in routine clinical practice as a predictor of postoperative mortality. We do not agree; although the ‘optimum’ prognostic lactate value determined by ROC analysis (6 mmol/l) had reasonably high sensitivity and specificity, the positive predictive value was only 32% because of low mortality. Initial postoperative serum lactate cannot be considered a ‘good’ predictor of mortality in this group of patients. Some advocate the use of base deficit as a prognostic parameter. Although the initial base deficit was worse in non-survivors compared with survivors, the presence of a clinically relevant base deficit was not associated with non-survival. The combination of variables reflecting metabolic acidosis with hyperlactataemia did not significantly improve predictive value for mortality. Although initial lactate correlated with total bypass time, the lowr value suggests that this relationship is not clinically important. As patients with a severe hyperlactataemia (>6 mmol/l) did not have a significantly longer bypass time, we speculate that the raised lactate, and hence the underlying tissue oxygen debt, may be related not to the duration of bypass, but to hypoperfusion during the cooling and rewarming phases. The overall rate of group 1 (end organ) complications was 24.2%, which compares with complication rates of 29.3%6 and multisystem organ failure rates of 26.8% reported in previous studies.5 Since peritoneal dialysis catheters are placed routinely at operation in the majority of our patients, our unit has a relatively low threshold for the institution of dialysis for oliguria or severe acidosis. Therefore a dialysis rate of 15% in this group of patients might be higher than at other institutions. We were surprised that only 6% of our patient group manifested clinical evidence of seizures. Initial serum lactate varies widely among both survivors and non-survivors after surgery for complex congenital heart disease in children. Initial lactate concentrations are a poor predictor of mortality and the routine measurement of serum lactate for this purpose cannot be justified. However, serum lactate may prove to be a useful indicator of postoperative complications. The use of base deficit is of no value in predicting mortality. (1994) Value of elementary, combined, and modelled hemodynamic variables. J Crit Care 9:223–235. (1992) Prospective evaluation of the paediatric risk of mortality (PRISM) score. Arch Dis Child 67:196–200. (1993) Lactate clearance and survival following injury. J Trauma 35:584–589. (1994) The value of blood lactate determination in the post-operative phase. Anaesthesiologie und Reanimation 19:103–109. (1995) Initial post-operative serum lactate predicts outcome in children after open heart surgery. Crit Care Med 23 (suppl 1) A205. (1996) Serum lactate predicts post-operative complications after pediatric cardiac surgery. Pediatr Res 39:54A, :307..
(1996) Useful or useless: sequential lactate levels following correction of complex congenital heart disease. Intensive Care Medicine 22 (suppl 3) S282. (1995) In-hospital mortality for surgical repair of congenital heart defects: preliminary observations of variation by hospital caseload. Pediatrics 95:323–330. (1991) Practical statistics for medical research. (Chapman and Hall, London), pp 417–418. (1993) Splanchnic lactate production in cardiac surgery patients. Crit Care Med 21:S84–S91. (1979) Peripheral vascular resistance and angiotensin II levels during pulsatile and non-pulsatile cardiopulmonary bypass. Thorax 34:594–598. (1986) Pathophysiology of hepatic ischaemia in cardiogenic shock. Am J Surg 151:87–97. (1993) Response of critically ill patients to treatment aimed at achieving supranormal oxygen delivery and consumption. Relationship to outcome. Chest 103:886–895. (1987) Systemic and intestinal limits of O2 extraction in the dog. J Appl Physiol 63:387–394. (1992) Halothane-morphine compared with high-dose sufentanil for anesthesia and postoperative analgesia in neonatal cardiac surgery. N Engl J Med 326:1–9. (1995) The effect of esmolol given during cardiopulmonary bypass. Anesth Analg 80:28–40.